Every secret agent needs a femme fatale, right? 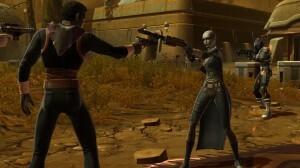 Well, the Imperial Agent gets Kaliyo- an interesting and compelling companion in many ways. For the first installment of their new Companions 101 blog, BioWare gives us more insight into this companion, her background and what she’s all about. Please Note: This blog contains spoilers for the Imperial Agent class story. Companions 101 goes on to tell us more about her, her quirks and what she likes and doesn’t like and how she will benefit you in the game. It’s definitely worth the read of you want to learn more about this companion and her story. To find out more information about Kaliyo including statistics, background, and her gift preferences, check out the Companions page on the Holonet! “While traveling through The Old Republic™ galaxy, you will encounter a variety of companions that can join your crew. This weekly blog is meant to be supplemental to our Companion Holonet series and it will provide insights and tips for each companion as well as a wallpaper and screenshots of their customizations. Each week, we will rotate between Imperial and Republic companions. Let us know who you would like to see featured in future blog posts by posting your suggestion in the official forum thread for this blog post. Blasters ready? Let’s go! Which companion do you want to see featured next at Companions 101? New Star Wars Game: First Assault Coming to XBLA?